Karen Ryan, Curator for Northern Canada at the Canadian Museum of History will discuss Finding Franklin? The Story Behind Death in the Ice – The Mystery of the Franklin Expedition Exhibition. Click the image below for a pdf of the poster. Trevor Bell, Geographer and University Research Professor at Memorial University of Newfoundland will discuss Empowering Indigenous communities to adapt to changing climate through social enterprise. Join the Arctic Institute of North America for a presentation by Senator Dennis Patterson on Solutions for Northern Canadians - one northerner's vision. The event is free, but we ask that you REGISTER to attend. (Click image for a pdf poster). 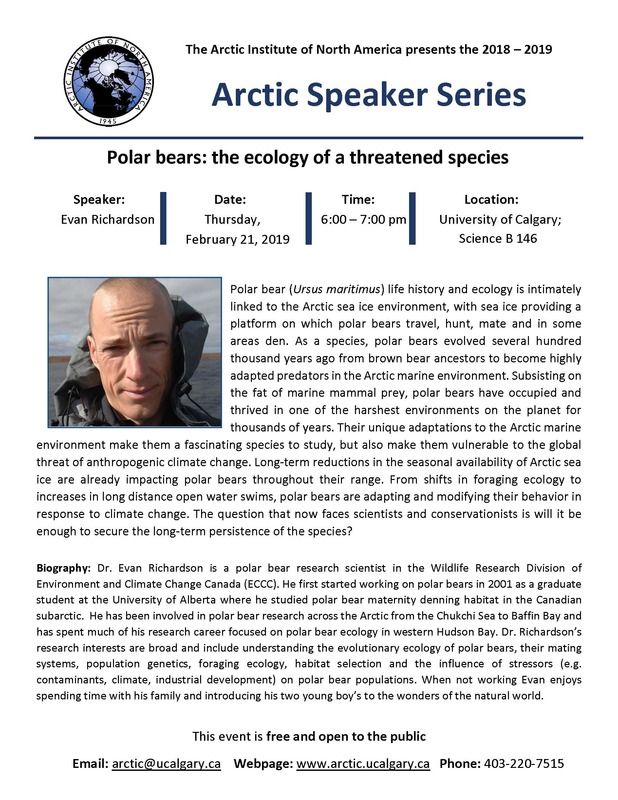 Join the Arctic Institute of North America Join the Arctic Institute of North America for a presentation by General (Ret'd) Tom Lawson on Canadian Arctic Sovereignty: The Importance of Being There. The event is free, but we ask that you REGISTER to attend. 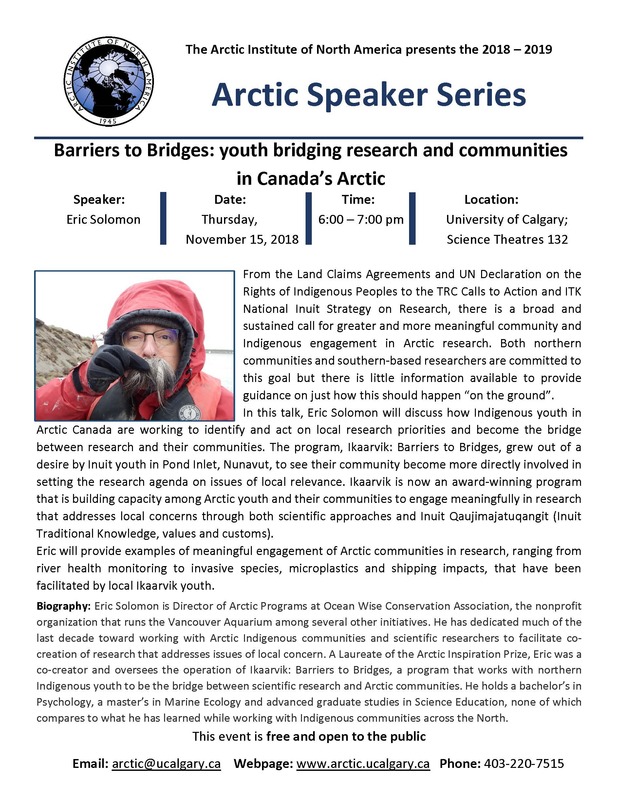 Eric Solomon, Director of Arctic Programs at Ocean Wise Conservation Association, will discuss Barriers to Bridges: youth bridging research and communities in Canada's Arctic. 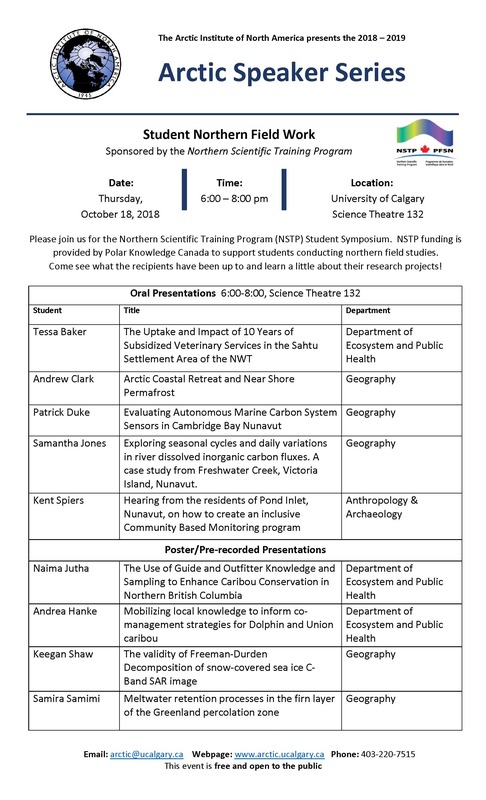 Please join us for the Northern Scientific Training Program (NSTP) Student Symposium. NSTP funding is provided by Polar Knowledge Canada to support students conducting northern field studies. Come see what the recipients have been up to and learn a little about their research projects! Dr. Maribeth Murray, Executive Director of the Arctic Institute of North America, will discuss "Arctic Climate Change Current, Past and Future". This is our final speaker for the 2017-18 Series. There will be a reception in the AINA offices (ES-1040) immediately following the presentation.